We all go through change; some of it unwanted and unexpected. Some people fear losing their retirement dreams due to the recent economic downturns. Others face job losses, unexpected health problems, financial difficulties and family loss through death or divorce. The only thing certain in life is that change happens. We can’t change the reality of change, but we can become more aware of how change changes us. Do we get bitter or do we allow it to make us better? My mother struggles with health problems and my father has had to assume more and more caretaking responsibilities. Her life has changed and so has his. He told me that he was now sewing curtains and cooking soup. He’s 81 years old and he’s never sewed or cooked anything before now. Sometimes he feels sad and scared, but in the midst, he’s still trusting God. How does one stay trusting and even joyful or peaceful on the inside, when on the outside life is falling apart? In this newsletter I’m going to share the first step of how to handle unwanted change. In my next newsletter, I’ll give you part two. Jesus comforts us with these words. “Don’t let your hearts be troubled. Trust in God, and trust also in me” (John 14:1) and “I am leaving you with a gift-peace of mind and heart. And the peace I give is a gift the world cannot give. So don’t be troubled or afraid” (John 14:27). We all know that things are going to change in our lives. We are going to get older and we are going to lose some things in life that are precious and dear to us. But knowing something and accepting it are two different things. Can we trust God in the midst of unexpected change and accept his hand in it or will we reject it as unfair? The first leads to peace; the second to greater pain. Everyone suffers when they experience unwanted change. We hurt, we cry, we yell and we grieve our losses. This is good and necessary suffering. And there are no shortcuts through this grieving process. It’s important to let yourself feel it, and equally important to learn to let it go. The writer of Ecclesiastes says, “There’s a time to cry and a time to laugh; a time to grieve and a time to dance” (Ecclesiastes 3:4). However, when we doubt God’s goodness and question his love, we add additional suffering to our lives which makes a difficult situation unbearable. Trusting in God’s goodness and love empowers us to handle the pain of change instead of becoming overwhelmed by it. We rest in the arms of the One who knows our pain and walks in it with us. Do you notice a difference in the degree of your suffering when you trust God in the middle of your unwanted change and when you don’t? Remember, one of Satan’s strongest tactics is to get us to question God’s goodness and his love. When you’re in the middle of unexpected and unwanted change, don’t forget this important truth: God knows what’s happening and nothing can separate you from his love. He is good whether or not you can see it right now. The psalmist rested in this truth. He said, “I am confident I will see the Lord’s goodness while I am here in the land of the living. Wait patiently for the Lord. Be brave and courageous. Yes, wait patiently for the Lord” (Psalm 27:13,14). Help, My Husband Has Been Diagnosed With Asperger’s Syndrome. Is There Hope? Question: My husband and I have been married 10 years with 2 small children. We’ve never had a good marriage, and it’s only getting worse in spite of years of marriage counseling. Recently, our counselor suggested he be tested for Asperger’s Syndrome, and it turns out that he has it. I am feeling rather hopeless with all I read. I doubt that we will ever be able to have a normal marriage. Do I stay and keep trying or do I leave before my children are negatively affected? Answer: First, before I answer your question let me define, or better describe Asperger’s Syndrome for those reading who may not know what it is. Asperger’s syndrome is a developmental disorder along the autism spectrum in which an individual may be very high functioning and intelligent but lacks in social awareness and processing. The brain of a person with Asperger’s works differently than someone without it, especially how it processes language and social cues. He or she processes language literally so he often misses or misinterprets what someone is saying. His focus is in the details of something and he has trouble connecting the dots to gain the big picture. Individuals with Asperger’s lack social awareness and aren’t able to pick up on people’s non- verbal cues or intentions. For example, most non-Asperger or neuro-typical individuals (NT as they are referred to) would clue in when someone they were talking to was bored or disinterested. A person with Asperger’s would not. Asperger’s individuals have a difficult time perceiving people’s intentions, needs, feelings, or motivations and therefore often respond inappropriately in social situations. They like routine, and have trouble managing their own emotions appropriately; especially when something unexpected happens or they are under stress. Describing or labeling their feelings can become a challenge for them. Because a person with Asperger’s syndrome has a hard time being aware of other people’s needs or feelings, he can be seen as selfish and uncaring. He often has problems managing anger and can appear rude, insensitive, and indifferent although he is usually shocked when someone accuses him of this because from his point of view he does care. He just can’t see where what he is lacking. He is neurologically unable to see things from another person’s point of view. His brain speaks a different language than a NT (Neuro-typical) person’s brain does. Being married to someone with Asperger’s syndrome presents challenges and opportunities. So does being married to someone with cancer, muscular sclerosis, blindness, bi-polar, or a host of other difficulties. Therefore, it’s important for us to remember that all successful marriages take hard work. No individual, no matter how talented, intelligent, or spiritual, has all 52 cards in their deck. Therefore, all marriages require that we learn some fundamental lessons about acceptance, forbearance, tolerance, forgiveness, love, sacrifice, and speaking the truth in love where necessary. Otherwise, Asperger’s or not, the marriage will not thrive. For you, the diagnosis of Asperger’s Syndrome must come as a relief after so many years of no progress in your counseling together. You and your husband have had 10 years of misinterpreting each other’s behaviors and motives. Perhaps you’ve seen him as selfish and uncaring. He’s seen you as critical and invasive. Those perceptions are tough to undue once they’re locked into place. Now you have a different paradigm in which to understand each other but the difficulties of communicating clearly remain. Your biggest challenge as to whether or not you and your husband can make your marriage work will not be the Asperger’s diagnosis itself but what your husband does with it. Will he use it as an excuse to continue to hurt you and your marriage? Will he go into denial, refusing to admit that there is anything different about his thinking processes or his social responses? Or, will he be willing to learn all he can about how this syndrome has resulted in differences and deficiencies and is he willing to work with professionals who have expertise in helping individuals and couples with this problem so that the two of you can develop a healthier, happier relationship? You too have some work to do if you want to move forward in a positive way from this point. Many people who discover that their spouse has Asperger’s Syndrome feel gypped and deprived of a full functioning partner. They will have to grieve some losses and let go of their desire for the deep emotional connection they longed for. However, some people with non-Asperger’s spouses also feel that loss or never have that connection either. Your husband will continue to struggle to “get” you and you will probably feel that you’re working harder than he is to make the marriage work. Again, I’m quite sure that women who are married to men who do not have Asperger’s feel the same way at times. But in any marriage, but especially one with special problems, your anchor must always be in God, not your husband, not your marriage or your own happiness. If you can trust God through this, then you will grow and thrive through this season, even if your marriage doesn’t. Recently a new book came out written by a husband who was diagnosed with Asperger’s and wanted to do all he could do to win his wife back. It’s called, The Journal of Best Practices by David Finch. Another resource for you is A Complete Guide to Asperger’s Syndrome by Tony Attwood. Friends, those of you living with an Asperger’s spouse, what do you do to cope? What resources have you found helpful? What encouragement can you give this woman? Add your comments to Leslie's answer to this question by clicking the link below. Reregister To Continue Receiving Our Newsletter! Plus listen in to Leslie's upcoming interviews with Focus on the Family! A sneak peak at the cover of Leslie’s new book! 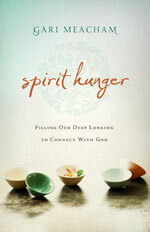 Spirit Hunger Book by Gari Meacham. Plus see the winner of the previous give away! REREGISTER TO CONTINUE RECEIVING OUR NEWSLETTER ! We have switched newsletter providers. We have continued to send via both providers so that all in our newsletter community could continue receiving our newsletter. We will be discontinuing our old newsletter provider (Constant Contact) as of March 1st (2013) to eliminate the multiple copies some followers are getting. If you haven't yet registered with our new provider, please do so now to continue being a part of this newsletter community. Use the link below to reregister using the opt-in box in the upper right hand corner of the webpage. If you are not sure if you are receiving the newsletter via our new provider, please feel free to sign up again using the link above. You will NOT receive duplicate newsletters as long as you use the same email address where you currently receive the newsletter. LESLIE'S UPCOMING INTERVIEWS WITH FOCUS ON THE FAMILY! We are pleased to share that Leslie's interview with Focus on the Family, "Finding Freedom from Destructive Relationships" was one of their highest response programs in 2012. Therefore, it is scheduled to re-air on February 6 & 7, 2013. 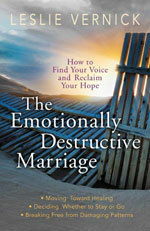 Also, Leslie's second interview, "Responding Well in Marital Conflict" is scheduled to air on February 18 & 19, 2013. HERE'S A SNEAK PEAK AT THE COVER OF LESLIE'S NEW BOOK WHICH WILL BE RELEASED THIS FALL! We have a desperate need for God--not just for following him, or being committed to him, but to be intimately connected to him. Spirit Hunger leads us to the crisp realization that our prayer life and our belief need to match. When we live in the fullness of prayer and belief, we're lead away from the crumbs and counterfeit, to a true hungering for God. Just email your name to assistant@leslievernick.com by midnight Friday, February 8th for a chance to win one of two copies! Congratulations to Retta C. of Normal, IL and Kelly Y. of League City , TX winners of the THE FANTASY FALLACY book by Shannon Ethridge. Feb 6 & 7 Focus on the Family Interview "Finding Freedom From Destructive Relationships"
Feb 18 & 19 Focus on the Family Interview "Responding Well in Marital Conflict"
"Leslie Vernick is a blessing! She is gifted by God for coaching. I pray more Christian coaches would use her techniques, they are priceless. She records each session for me to listen to and writes a summary of each session for me to follow. It shocked me to read and hear how much I missed during our coaching sessions. She is assessable between appointments for when I have questions or concerns. Best of all she prays for me. I have no greater help than God, and great is the hope that gives me to know He is her source of knowledge and strength. Accountability I now have a plan and hope."